While I call these Chocolate Muffins, their deep chocolate flavor and wonderfully moist texture, remind me more of chocolate cake. The chocolate flavor comes from both unsweetened cocoa powder and lots of semi sweet chocolate chips. Treat yourself in the morning to one of these delicious muffins with a strong cup of coffee or a tall glass of icy cold milk. The question is often asked "What is the difference between a muffin and a cupcake?". If you take away the frosting from cupcakes, the lines do become blurred, especially with this recipe. The big difference, I think, is how the batter is mixed. With cupcakes the creaming method is most often used, that is, where the butter and sugar are beaten together, to which eggs are added and then the flour is folded in. With muffins, most times you do not have to pull out the mixer, you only need two bowls, one for wet ingredients and one for dry ingredients. Combine the two and your batter is made. That is why muffins are what we call a "quick" bread. 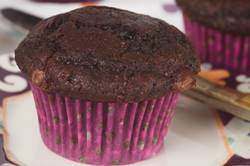 Buttermilk is used in this Chocolate Muffin recipe. Buttermilk has a thick creamy texture with a rich tangy buttery taste that makes baked goods tender. You can make a good substitute for commercial buttermilk by stirring 1 tablespoon of white distilled vinegar, cider vinegar, or lemon juice into 1 cup (240 ml/grams) of milk. Let this mixture stand for 10 minutes at room temperature before using. Lastly, it is hard to tell when chocolate muffins are baked and we definitely do not want to over bake them or they will be dry. So check them towards the end of baking and they are done when they are firm to the touch and a toothpick inserted in the center of a muffin comes out with a few moist crumbs. Chocolate Muffins: Preheat your oven to 375 degrees F (190 degrees C). Place the oven rack in the center of the oven. Butter, or line 12 muffin cups with paper liners. In a bowl whisk the eggs. Next, whisk in the melted butter, buttermilk, vanilla extract, and coffee extract (if using). In another large bowl, whisk together the flour, cocoa powder, sugar, baking powder, baking soda, and salt. Stir in the chocolate chips. Make a well in the center of the dry ingredients and then fold the wet ingredients into the dry ingredients. Stir only until the ingredients are combined. Do not over mix the batter or the baked muffins with be tough. Evenly fill the muffin cups with the batter (the muffin cups will be full), using two spoons or an ice cream scoop. Place in the oven and bake until a toothpick inserted into the center of a muffin comes out with a few moist crumbs clinging to it (about 20 minutes). Transfer to a wire rack and let cool for about 5 minutes before removing from pan.